Catalan chef Ferran Adrià revolutionized the food world with the gastronomic methods he put into practice at his pioneering restaurant elBulli. Adria’s “Notes on Creativity” is the first major exhibition dedicated to the visualization and drawing practices of this culinary master. The exhibition presents drawings, notes, notebooks, diagrams, pictograms and prototypes by Adrià and his collaborators. We caught up with Adrià at the exhibit, which is currently running at the Drawing Center in New York City. Where did you do most of this work? How do you come up with your ideas? 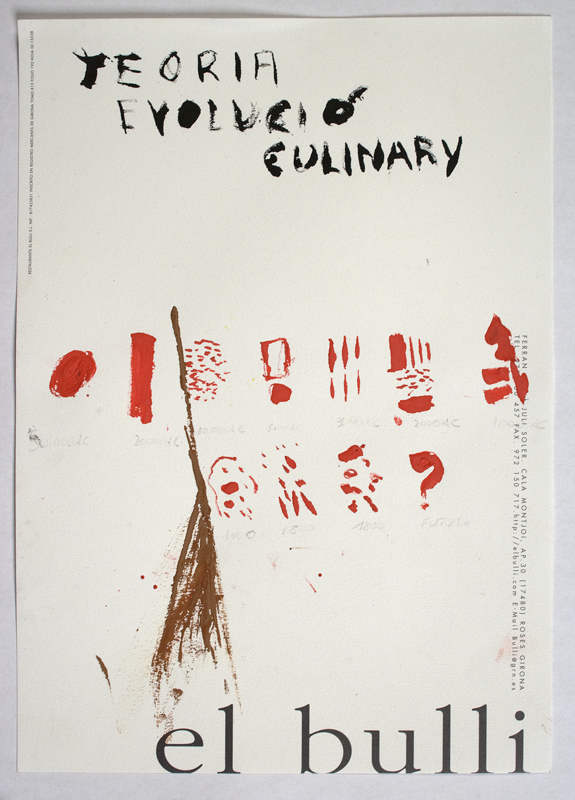 I made most of the drawings between the kitchen of El Bulli and el Taller, although in the exhibition you can see that I drew some at home and some even in a cab. I always have a pencil and paper with me, and when I have an idea, I jot it down, so I don’t lose it. Most of the time I limit myself to writing the words that define the idea, but in other cases I define the idea through a drawing. I don’t think so. To be creative you must be passionate about creativity, and this is difficult to spark. Passion is felt; it can’t be learned or imposed. Creativity is my great passion; it comes naturally to me. What can be done, however, is to reflect about creativity, in order to be more effective, in order to optimize it. Creative processes can suffer from blockages. How do you overcome the equivalent of writer’s block in cooking? How do you keep your creative juices flowing? Often times an idea gets blocked, and you don’t achieve the expected outcome. There are different ways to approach this, but I don’t force it. If something doesn’t work out then I put it aside. I don’t obsess over it. I try looking for a different way. And oftentimes while you’re working on another idea, you’ll find a response to the problem that prevented you from materializing the initial idea. The important thing is to not be discouraged. If an idea doesn’t work out, go find another one. If not, you might spend your whole life trying to achieve one thing, and in the end not get any results. What role does the balancing of opposites play in your process of creation? For instance, how do you balance rational and intuitive approaches? With cooking, as with all disciplines, creativity is accompanied by a certain knowledge and intuition, which filter and fine tune ideas unconsciously. It’s what we call “mental palate”. Take an idea: we immediately analyze it mentally, and we visualize how it could make sense if applied to cooking. In this manner, when you begin to develop an idea, your mind guides the way in which you have to work in order to achieve a gastronomically interesting result. Do you feel a form when you taste a dish, or taste a dish in the act of drawing? Do you experience any kind of synesthesia when you create? Yes, in a certain way. I guess we could say that what we call “mental palate” encourages synesthesia. I mean, if I have an idea for example, and I imagine a dish of chocolate with violets, the taste and texture of these two items is perfectly registered in my mind, so I can mentally imagine the gustatory association it will produce. It’s not 100% real, but it’s really helpful to know beforehand if an idea makes sense or not. Please fill in the blank and elaborate. The pen is to drawing and designing what the ............ is to cooking. The pen is to drawing and designing what the brain and the hands are to cooking. Ferran, you are a master in finding the essence, of dissecting things into their primary components. If you had to list the key components of “the Latin way,” what would they be? And “the American way”? What ingredients constitute what you would call “American”? Dreaming and the perseverance to achieve your dreams. Through your Bullipedia project, you are trying to codify the culinary discipline. Is this approach transferrable to other fields or disciplines, do you think? If so, which fields and why? Yes, with Bullipedia we decode and organize the culinary discipline, in order to arrive at a valuable tool from a pedagogical and knowledge accumulation point of view, but also because it will be an extremely valuable tool to create. Bullipedia is an organizational tool that could easily be applied to different disciplines, it just has to be applied to each one of them with the corresponding variations. If you were a dish? What would be the ingredients? I would love to be a glass of water. Photos courtesy of elBullifoundation. Translation by José Antonio Villarán.